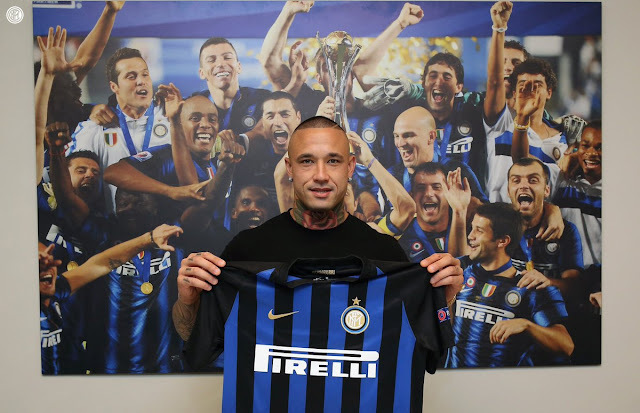 Belgium midfielder Radja Nainggolan has joined Inter Milan, signing a contract that runs until 2022. Radja Nainggolan is officially a new Inter player. The Belgian has signed a contract with the Nerazzurri that runs until 30 June 2022. Born on 4 May 1988 in Antwerp to a Flemish mother and Indonesian father, he shared a passion for football from a young age along with his twin sister Riana. He started out at local side Tubantia Borgerhout. In 2000, he moved to the youth academy of historic Antwerp club Germinal Beerschot where he remained until 2005 when he was spotted by Piacenza scouts before turning 18. Radja then moved to Italy and made his Serie B debut on 28 May 2006 for the club from Emilia who were coached at the time by Giuseppe Iachini with Piacenza losing a home match to Arezzo 2-3. During his time with the Biancorossi, Nainggolan made 74 appearances and scored four goals in the second division and Tim Cup, establishing himself as one of the league’s most interesting prospects. In January 2010, he made the big step up to Serie A. Massimiliano Allegri’s Cagliari took a chance on the Belgian who made his debut on 7 February that same year against Inter at San Siro. He came on five minutes from the end for Jeda as the Sardinians fell 3-0 to Josè Mourinho’s side. His performance levels and value increased match by match and the Belgian soon became a real pillar in the Rossoblu’s midfield. He stayed at Cagliari for four years, making 137 appearances and scoring seven goals in the league and Coppa Italia with his above-average performances, drawing attention from clubs across Italy and Europe. At the end of the January transfer window in 2014, Radja was signed by Roma. The Belgian moved to one of Italy’s biggest clubs and quickly became a key figure in the side led by Rudi Garcia, both in the league and Champions League. His constant growth continued in 2016 when Luciano Spalletti returned to Roma. Under the Tuscan, Nainggolan completed his transformation into a complete midfielder as he was capable of playing in any role in the centre of the pitch thanks to his exceptional physical and mental attributes, while he also added finishing to his game. For the Giallorossi, Nainggolan was able to adapt to the role of the attacking midfielder in an unorthodox fashion, becoming a lethal weapon in Spalletti’s arsenal. He made himself a threat with his constant runs into the box and shots from outside the area and it’s hard for Inter fans not to look back to the brace he scored in Milan against the Nerazzurri on 26 February 2017. Overall, after four-and-a-half seasons with Roma, Nainggolan proved himself to be one of the most complete players in his position, making 203 appearances and scoring 33 goals in Serie A, the Tim Cup, the Champions League and Europa League. With Belgium, Radja came through all of the youth teams before earning his first senior cap on 29 May 2009. He has made 30 appearances for the Red Devils and has scored six goals. Now, having fully matured as a player, it’s time for the Ninja to approach a new and exciting challenge in an Inter shirt. Welcome to the city of Milan, Radja!